She watched as they all scurried about in their preparations. The anniversary of the planet swinging around the star meant nothing to her, and it baffled her as to why they insisted that the event was noteworthy. 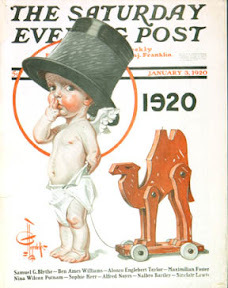 A picture of an old magazine cover served as the inspiration for the festivities showing a baby in a top hat of all things. Pure foolishness. They all began chanting as the seconds ticked down, and more than one man tried to sidle up to her and get her attention, but she gave them a look the deflected their enthusiasm to a more willing target. When the countdown stopped, people shouted, tossed confetti into the air, embraced one another, and even kissed. From one moment to the next there was no change in feeling, no change in thought process, no shift in the powers of the cosmos. She gave a harrumph, and left these tiny creatures to their tiny celebrations of their own mortality, it was of no concern to immortals.